Wash the chicken well and marinate with yogurt , Ginger garlic paste , chilli powder and salt. Dry roast the whole spices in MW or kadai and grind it to a nice powder. Heat oil in a heavy bottomed kadai . Add onions and saute well. Add curry leaves . Now add the marinated chicken . Stir in between . When the chicken gets cooked add the dry masala powder. Mix well and cook again for 15 more minutes or till chicken is crispy. 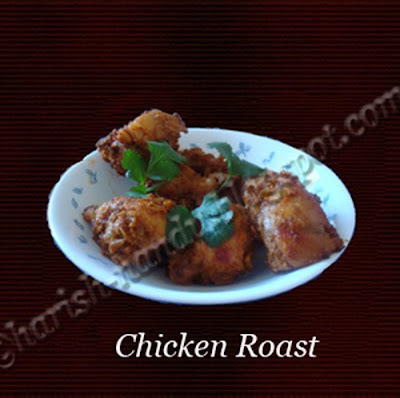 I love chicken roast like this,spicy and delicious. My sister used to make a similar dish.. looks great. Chicken looks so good. Nice recipe. YUM!. Love chicken in any way. Love chicken roast! This looks so good! Your Recipes site is really great.